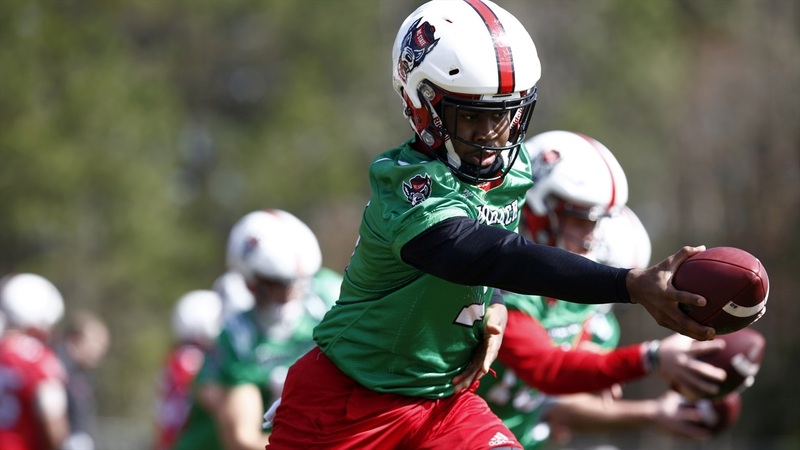 Matt McKay: "I’ve Focused On Taking Command Of The Offense"
Redshirt sophomore Matt McKay shares his thoughts on the quarterback competition, how he has improved this spring, and much more. What have you learned from the Ryan the last couple years? I definitely feel like I improved my mechanics and knowing the game. With more reps you get better and I’ve gotten experience. I definitely learned a lot from Ryan. How different is practice from a game? It’s very different. A game you have crowd noise and it’s faster. At the end of the day, you trust your training and believe in coaches and the team. How has the spring gone for you? It’s been good. I’ve gotten more reps, which helps. I’ve focused on taking command of the offense and pushing the tempo. What challenges have there been? The challenges have been understanding the offensive philosophy. Defense threw some new wrinkles at us this spring, so understanding how they do it and the way they play. How do you view the number of quarterbacks from NC State in the NFL? It’s an opportunity looking back at them and I’m very appreciative. I want to be one of those guys in the room. Are you a take charge guy? Yes. I still need to improve there, but I’ve grown by taking charge more often. Is that an intangible that you talk about? I like to smile and bring energy. It’s a blessing to be there and make sure nobody is sad or miserable out there, because we’re at a power 5 school. It’s a once in a lifetime opportunity. How do you slow the game now? Film is the biggest thing. Making sure I prepare right and study the defense. Put yourself in that position. 3rd and two, don’t go for the deep ball, get the small slant and get a first down. What did you learn from Ryan’s decision making? Know what the defense is doing and what they’re giving you. Know where to go with the ball. If they bring pressure, know where you’re going. He was very good at it.